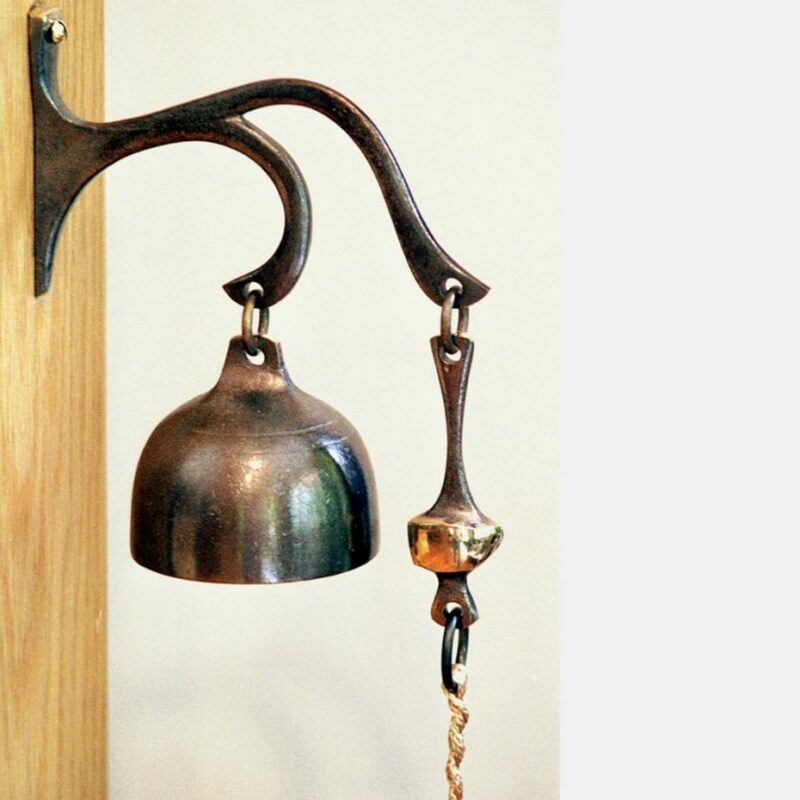 I began making bells almost 40 years ago with a welding torch and anvil in a small garage. 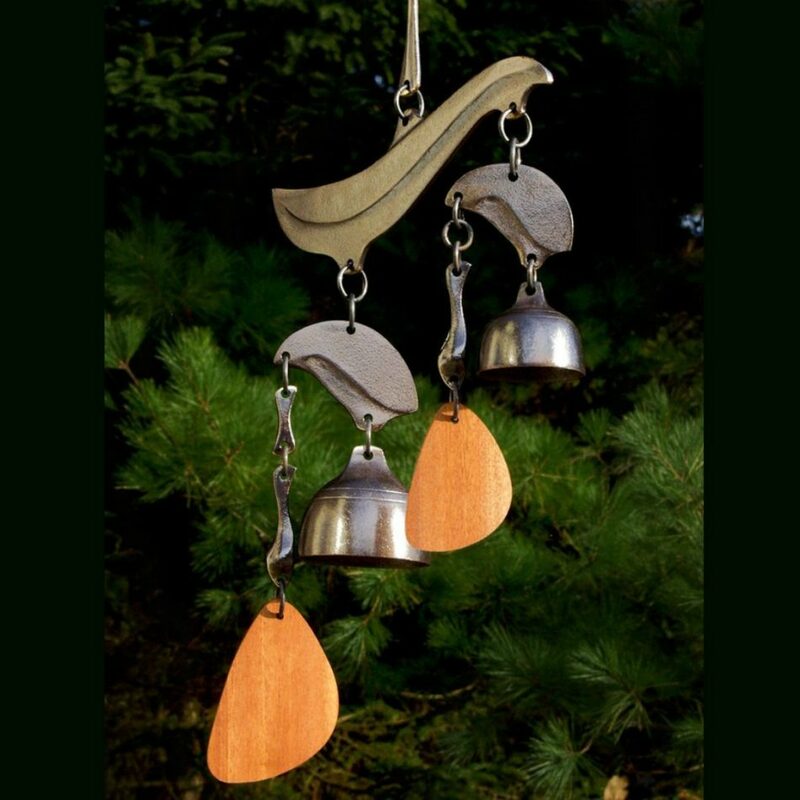 I cut, hammered, and welded together pieces of sheet metal to produce my first wind bells. They were crude, but people seemed to enjoy their mellow cowbell tones. I purchased a peddler’s license, and on Saturdays during the fall of 1970 I would drive into Boston and sell my week’s work from a pushcart in a few sociable hours. It was fun for awhile, and offered a brief and pleasant tie with the colorful tradition of street vendors that I always enjoyed on visits to the city when I was young. Later I learned of the American Craft Council fairs at Bennington, Vermont. These shows opened the door for a career in crafts, bringing me into contact with an exciting network of supportive galleries and craftspeople from the entire country. In 1975 my wife Cindy and I moved to Maine, where we built our home and enjoyed many happy years raising our four sons. Our first workshop arose from wood cut on our own land. It was rustic, but it served us well for several years. Although the sheet metal bells had been successful, the range of forms and sizes was limited. I became interested in the technique of bronze casting, which offered many new possibilities. In 1982 we built our original foundry building. There is no school for foundry work, especially as it applies to bell making. So there was a lot of experimenting. It was a slow way to learn, but we progressed. Thankfully, people continued to enjoy and purchase our work. 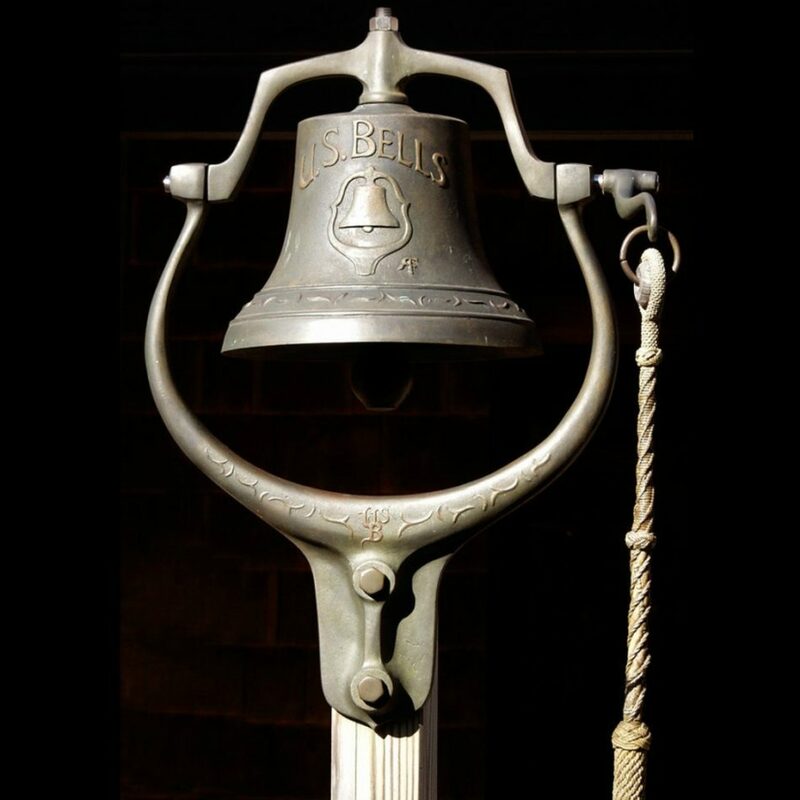 Gradually over the years we have been able to acquire the techniques and equipment to operate a successful foundry business specializing in bells. Much of our process is entirely conventional, if old fashioned. In fact the molding machine shown in our foundry illustration was made in 1946, the same year I was born. I have always enjoyed showing our customers about sand casting and watching their fascination grow as the molten bronze glowing with heat flowed quietly into the heavy black molds. When they see the work and care that goes into every aspect of the bells, they look at our finished pieces with genuine interest. 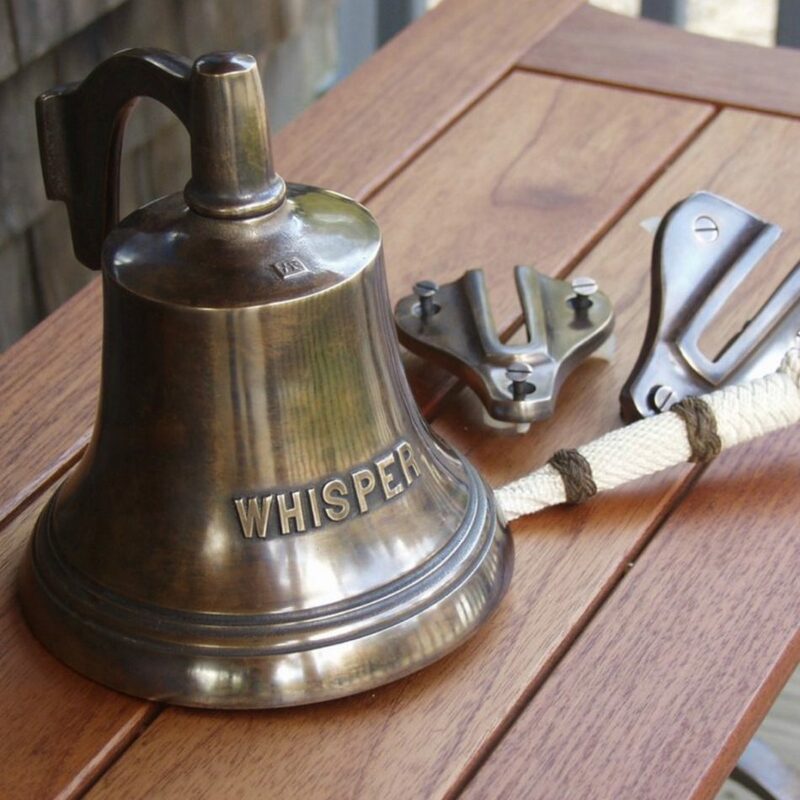 In the past several years we have expanded our foundry four times, built a finishing shop and our own US Bells store. We now sell our work in Prospect Harbor as well as through other galleries, direct mail and online through our website. Although we are still a small family run business with only three employees, our bells are widely recognized for their quality of tone and integrity of design. Throughout this work, I have also built larger one-of-a-kind wind bell sculptures. These pieces may use a single bell or several, that are tuned to sound in random harmonies that vary with the weather. There are always constraints, such as scale, intended location, and cost, which limit yet help to define the forms needed for the structural and mechanical components of these sculptures. The challenge is to create a piece that solves the technical problems and evokes both functional and visual integrity. The dynamics of creating an object that stands independently outdoors and moves with the wind to produce a rich spectrum of sounds are as stimulating to me today as they were when I welded together my first steel wind bell in 1970. The deepest motivation for my work has always been to establish a connection with nature. My bells can remain outdoors year round, through winter blizzards and quiet summer breezes. As the weather changes, so too does their song, which, for me, becomes a vibrant reflection of our living world.